Every family has their traditions, and they usually fall somewhere on the spectrum between quirky and time-honored. One of my favorites is the annual Christmas cookie swap that brings the family together for a baking extravaganza I’d liken to a bustling scene of Santa’s little elves on Christmas eve. Confectioner’s sugar dusts everything and everyone, wine is sipped, laughs are had, and there always seems to be room for just one more cookie in your tin. When the day finally arrives, our host will have stocked up on all the necessary ingredients for a day of cookie baking: sticks of unsalted butter softened on the counter overnight, bags of brown sugar stacked high like presents, confectioner’s sugar and flour standing by like guards over shining foiled packages of chocolate chips. Every cookie baker—usually a mix of family members (kids included!) and a grab bag of friends—submits a recipe or two of their own choice, from the classic picks to a few newcomers, hoping to make the cut for years to come. I've never felt closer to my family than in those precious moments. It sounds cheesy, and maybe it is, but for me, being in the thick of baking, only to come out the other end with the treasures of the day cooling on the parchment-lined dining room table and even a few stray chairs, is absolutely priceless. The second-best feeling? Packing up our various vintage cookie tins with the knowledge that there’s still plenty of Christmas spirit left to share. Whether you were a fervent holiday baker and master of family tradition or not, we'll give you some tips on making traditions your own and how to add contemporary twists to classic Christmas bakes for standout desserts dressed to impress. If the idea of handing your kitchen over to family and friends for a baking-induced frenzy makes you want to keel over, know that this isn’t the only way to tackle the holiday baking tradition. If you grew up in a household that didn’t hold on to traditions or exalt the last month of the year, doesn’t meant you can’t set the foundation for a celebration of your own. The first step is to spread the love and send out the invites, trying to keep it manageable so you’ll want to do it again the next year. Once you’ve got your group together, decide how you’ll attack it: Will you each bake something to share? Maybe you’d rather bake a single giant cake recipe together, then binge watch a few holiday movies? Perhaps you want to make it a little competition of who can make the best fill-in-the-blank? If you’re having trouble thinking of what might work best (and be the most fun) get your guests involved! But remember, traditions are traditions because they evolve over time, so if you pull out that one game no one wants to play while the cake is cooling, you can always leave it packed up next year. As a former picky eater, I have a lot of experience taking little bites of things (even Christmas cookies and other baked sweets) only to leave gnarled remains behind. Kids are notorious for this—whether they lend a hand in the making of the said dessert or not—but that doesn’t mean everything has to be plain-old chocolate or vanilla just for them. Do something different with your baking recipes by experimenting with just one or two flavor components at a time. Take our shortcut stollen for example. It’s still a stollen, but we changed out the typical marzipan, candied orange and lemon, and raisins for white chocolate, chopped pistachios, and homemade candied mandarin peel for a new note of fragrant sweetness to still give you the classic citrus flavors you’d expect. Plus, it's perfect for last-minute baking because, unlike a regular stollen, it doesn't need to rest. In this pavlova recipe, we add flavor to our autumnal compote of apples and pears with vanilla bean and fresh tarragon, which lends a surprising note of anise that pairs well with the spice of warming cinnamon and creamy mascarpone. Pavlovas are an easy dessert to experiment with, and while our recipe might have flavors geared for an older (or should we say more refined?) palate, here are lots of options for making delicious variations. Instead of messing around with flavors, you could simply think about combining your favorite desserts into a new baked good that will surely reign supreme. Our gingerbread-spiced crème brûlée cookies put a little holiday flair on the idea of crème brûlée by piping vanilla pudding on top of cakey gingerbread cookies and torching them before serving. Baking is a science. That doesn’t mean it’s incredibly difficult, but it does mean that, sometimes, things can go wrong. Mix up the baking powder and the baking soda, the sugar and the salt, and the result will be less than ideal. Keeping a stock of the classic baking ingredients on hand—more than you need—is the best way to stay ahead of the game and roll with the punches. Things like butter, eggs, milk, flour, sugar (granulated, brown, and confectioner’s), vanilla extract, baking powder and soda, and chocolate chips are easy to pick up ahead of time and find other uses for, should they go untouched. Stocking up on other sweet extras that could be worked into a recipe spontaneously is also a nice option to showcase creativity and channel your inner Christina Tosi. Caramel sauces (homemade or store bought), dried fruits, fresh herbs, sprinkles, or ingredients like tahini, honey, rosewater, or orange blossom water can get you started. Use our recipes for spritz cookies with a figgy caramel filling and chocolate cake with fluffy tahini frosting for inspiration. In addition to having the right ingredients (and plenty of them), having the right tools is just as important. 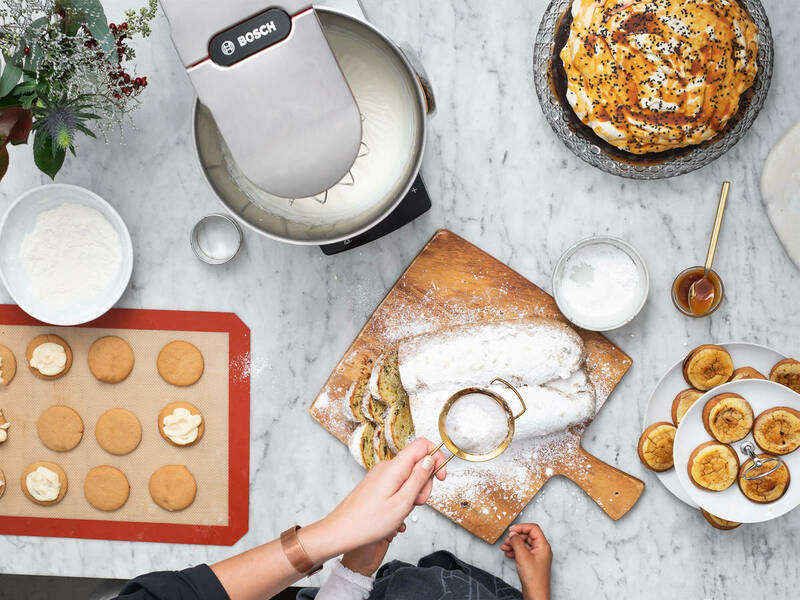 A versatile kitchen machine like the Bosch OptiMUM features a large bowl capacity, SensorControl Plus for hands-off utility, an integrated scale, and more to make it easy to whip up all your favorite holiday desserts in no time. The Bosch OptiMUM isn’t just for baking, and sometimes being in the kitchen with all those sweets makes you crave something savory. Prepping an easy dish for lunch or dinner like soup or stew will make your guests happy and keep you from feeling overloaded on a sugar-high. It should go without saying, but whether you have two people in your kitchen or 20, the most important thing when it comes to winter baking (any baking, really) is to have fun. Keep it light and when the energy fades offer up tea or coffee for the road, and loop in the little ones when they can help out (and keep everyone entertained) in the kitchen.